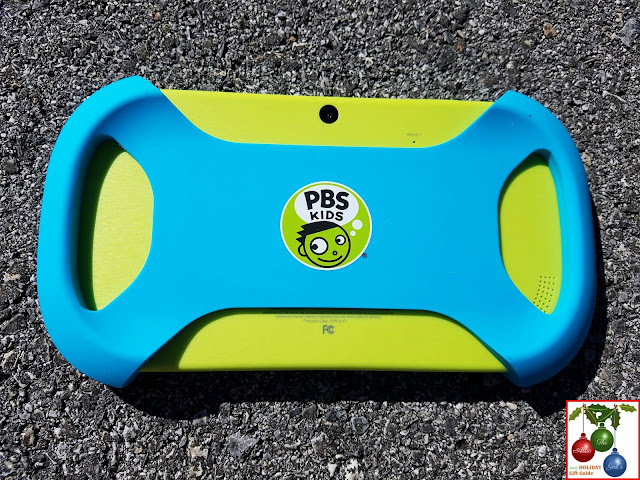 I received a PBS Kids Playtime Pad tablet for review. This post contains affiliate links. All opinions are mine. My kids watch PBS KIDS on a daily basis because of their quality educational programming. Some of their favorite shows are Daniel Tiger's Neighborhood, Super Why, and Peg Plus Cat. They love the fun story lines, and I love that they are learning without even being aware of it. 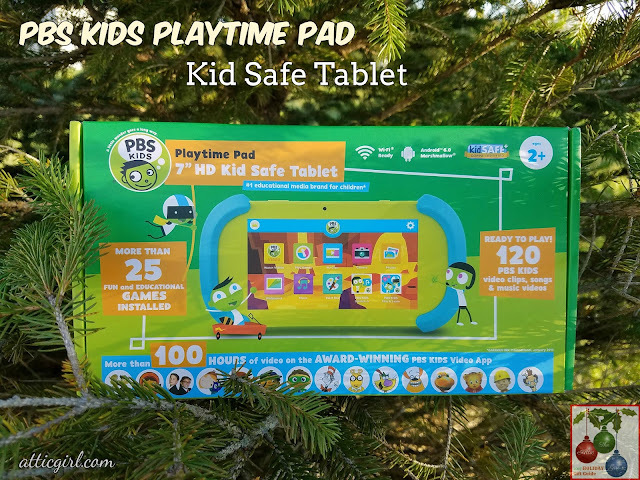 PBS KIDS has released a kids tablet that enhances learning, called the Playtime Pad, that is one of our top picks for our 2017 Holiday Gift Guide. 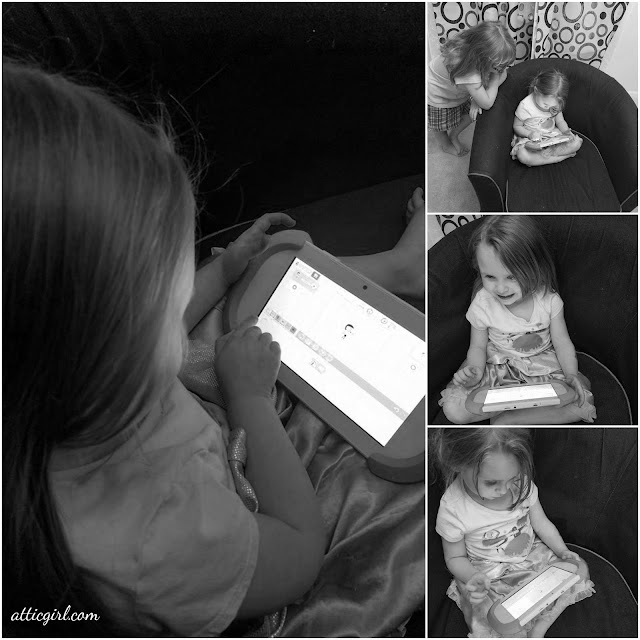 The PBS KIDS Playtime Pad is a 7" Kid Safe Tablet that both my preschooler and my first grader can use. 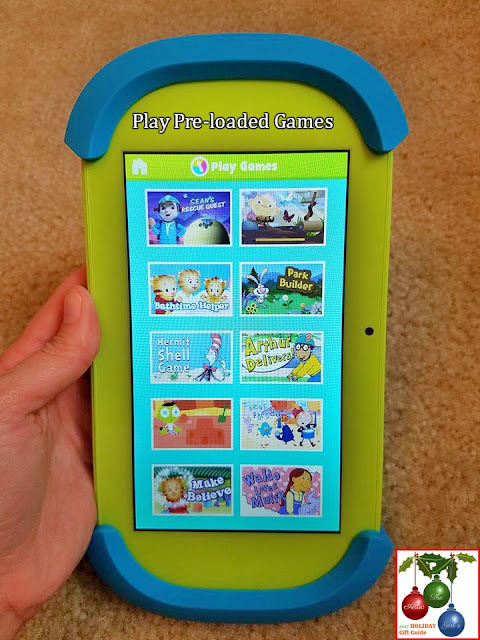 It's a good size for little hands and has more than 25 educational games, 120 PBS KIDS video clips, songs, and over 100 hours of video that come pre-loaded. 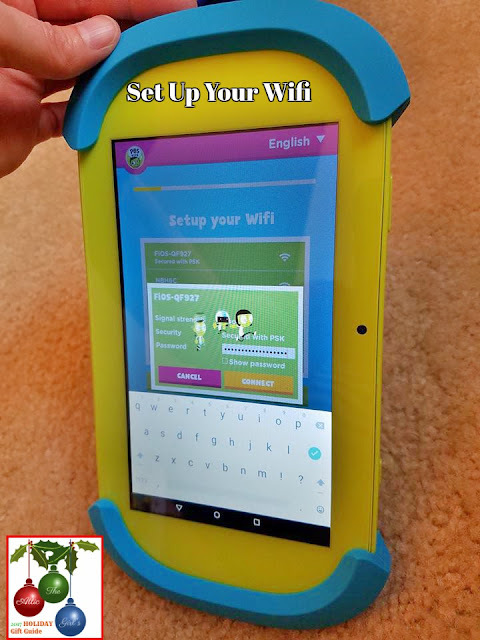 It is wi-fi ready, supports BlueTooth, and includes PBS KIDS Scratch Jr, PBS Parents Play & Learn, and the award-winning PBS KIDS Video app. The tablet comes with a USB cable, charger, instructions, and a bumper pad. While the blue bumper pad is thick and has helped protect it from a few drops, it is too easy for my three-year-old to take off. It would be more "kid proof" with an actual case. We may purchase the i-Unik PBS Playtime Pad/Ematic Funtab 3 7 inch Handstrap Kid Tablet Case in the future. It is very easy to set up the tablet with the included instructions. You set the date/time, and connect to your home wifi. It will also ask for your email address so you can set up an account. They will send you an email that you will need to confirm (or you can choose to add a credit card for a small fee). Once that is done, you can set up profiles for each child with their own icon. A nice selling feature of this tablet is that you can watch pre-loaded video clips, play the pre-loaded games, and listen to songs without any wifi at all. This is great for after school activities, appointments or in the car. You'll need to hook up to wi-fi to use other apps and video streaming. My favorite feature of this tablet is the parental control settings. When in Kids Play Mode, your child only has access to the apps that you approve. This way, my kids can't access outside websites like Youtube. In order to exit Kids Mode, it also requires a parental password. This is very reassuring as a mom who doesn't want her three-year-old web surfing and stumbling on inappropriate content! You can also set time limits for screen time. If you exit Kids Play Mode, you have full access to the internet, all apps, settings, and Google Play. Both of my girls enjoy coloring, playing games, taking photos with the dual camera, and watching their favorite PBS Kids videos! The PBS KIDS Playtime Pad is sure to be a hit with your kids ages 2-8! PBS KIDS also has a streaming stick that plugs into your tv, the PBS KIDS Plug & Play, that would make a great holiday gift! 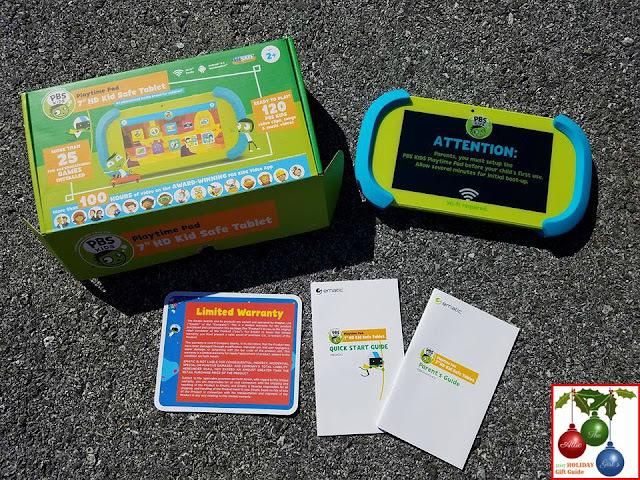 One hundred percent of the net proceeds PBS receives from purchases of the PBS KIDS Playtime Pad & PBS KIDS Plug & Play support the PBS KIDS mission to help all children, especially those at risk. The PBS KIDS Playtime Pad is available in stores like Wal*Mart, Best Buy and on Amazon for $79.99. 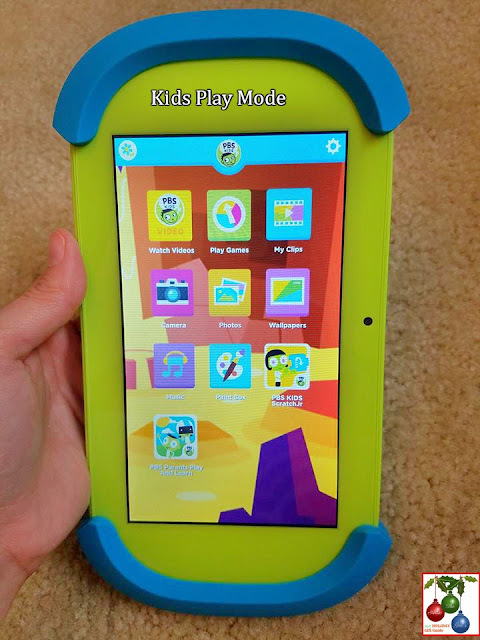 3 comments on "PBS Kids Playtime Pad Tablet @pbskids #Sponsored #HolidayGiftGuide"
I love parental control over the web and limiting time. That is so important. Pre loaded video, songs and games are awesome for anytime you are not at home. I would want a case as my grandchildren can be a bit careless. Great gift idea! I have a 3 year old grand niece who LOVES electronics--this would be the perfect gift for her. I love that it has parental controls--but the Mom or Dad can switch it and use it for themselves as well. This would be perfect for my daughter. I am always worried about her being on my tablet.